Russia’s ministry of industry and trade has unexpectedly cancelled the Beriev Be-200 amphibian SaM146 replacement engines project. The French-Russian substitute engines would replace the original Ukrainian powerplants, and are produced by PowerJet, a joint venture between Russia’s UEC-Saturn and France’s Safran Aircraft Engines. Prosecutor general Yury Chaika revealed in a speech at the Federation Council (the upper chamber of the Russian parliament) that the office of the prosecutor general had disallowed the replacement of the original Ukrainian-made engines in the Russian amphibious aircraft with SaM146 engines – because they “contain components from NATO countries,” Russia state news-wire RIA Novosti has reported. 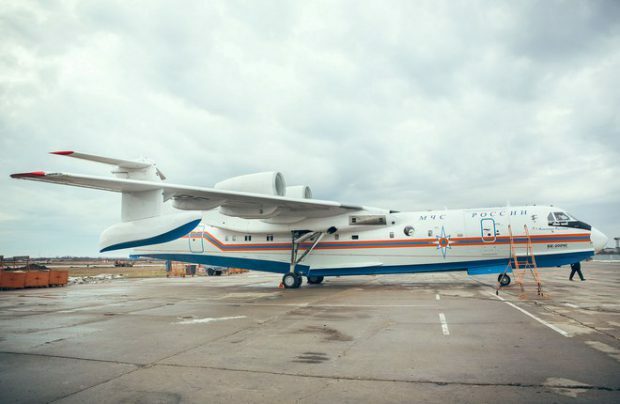 Re-powering the amphibious aircraft with SaM146s is a project originally envisaged by the industry and trade ministry because it would assist the developmental needs of Russia’s ministry of defence, and was a project with an estimated 13 billion roubles cost. With the Be-200 currently powered by two D-436TP engines produced by the Ukrainian company Motor Sich, the supply of these engines remains questionable because of the discontinuation of defence and aerospace cooperation between Moscow and Kyiv. Meanwhile, a source close to the United Aircraft Corporation (UAC) has revealed to Russian Aviation Insider that the replacement engines programme has been suspended, not cancelled. The latest decision was influenced by several factors, including the overall shortage of SaM146 engines, a situation that cropped up this year because of the need to create a pool of replacement engines for operators of the Superjet 100, the main platform for the engine. In addition, the SaM-146 has yet to prove its operational capability in marine conditions in which the engine is exposed to corrosive sea water. A combination of these factors could easily delay the implementation of the programme for at least two years, the source summarised. UEC-Saturn and Safran Aircraft Engines initialled their framework agreement regarding the development of SaM146 modifications for the re-engined Be-200 in May 2018. Amongst other specific developments, presumed propulsion works included a new nacelle, an over-the-wing mounted engine pylon and a significant update of the FADEC digital engine control system software. It was envisaged that the newly-re-engined Be-200ChS-146 would get off the ground in March 2020. Russian certification of the SaM146 engine and nacelle for installation on the aircraft was scheduled for the end of 2020, and certification of the entire aircraft, with the new engine, was planned for September and November 2021. It is hoped that further certification of the Be-200ChS-146 to the standards of the European Aviation Safety Agency (EASA) and the United States’ Federal Aviation Administration (FAA) will eventually allow the aircraft to enter the European and American markets. Be-200ChS-146-E with the D-436TP engine was originally certified by EASA in 2010.